Many golfers' worst nightmare -- a ball in a sand trap. When a player hits a golf ball into a sand trap, there are two important aspects he must consider -- aside from playing the next shot -- that relate to the sand. First, there’s the standard rule of golf etiquette that requires players to rake the sand they disturb after they hit the shot, so the next poor soul who lands in the bunker at least can play from a smooth surface. Additionally, there’s the rule that forbids players from touching the sand with a club -- commonly known as “grounding” the club -- prior to hitting from a bunker. Whether you may ground your club after playing a sand shot depends on where the ball lands. 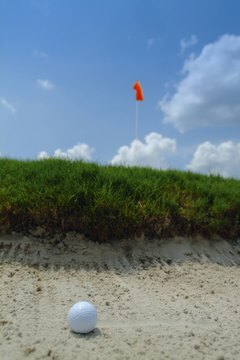 Sand traps, also known as bunkers, are placed strategically around the course, but generally near greens. Golfers typically use sand wedges to hit from traps. These clubs feature a large bounce plate on the sole. Standard bunker play calls for the golfer to strike the sand with the bounce plate, an inch or two behind the ball. Rather than digging into the sand, the bounce plate literally bounces off the surface, helping the golfer propel the ball out of the trap. Under Rule 13-4 of the standard Rules of Golf published by the United States Golf Association, a player may not ground a club in any hazard -- including a bunker -- before striking the ball, although there are a few exceptions. The main reason for this rule, as it applies to bunkers, is that grounding the club can affect the ball’s lie, particularly since the golfer will likely strike the sand at or near the spot she grounds her club when she plays her shot. Unlike other golf course surfaces, sand will move easily. Therefore, as Leaderboard.com explains, “It is impossible to allow the club to touch the sand without depressing the sand, no matter how slightly.” The penalty for violating Rule 13-4 is two strokes in stroke play, or the loss of the hole in match play. Rule 13-4 prohibits a player from grounding a club only “before making a stroke at a ball that is in a hazard.” Once a golfer hits the ball out of the bunker, there is no penalty for touching the sand with his club -- although etiquette dictates that he should then smooth out any marks he made in the trap, including those made when grounding the club after the shot. Hitting from a bunker isn’t easy, particularly for casual golfers. It’s far from unheard-of for a mishit bunker shot to land in the same bunker. In this case, Rule 13-4 remains in play, since the ball remains in the bunker; the player can’t ground her club. For example, according to USGA Decision 13-4/35, if a player hits a bunker shot and the ball remains in the sand, and the golfer then swings her club into the sand, she’s charged with a penalty, even if her actions don’t affect the ball’s lie.